Takeaway: The environmental and efficiency gains over dry blasting make nozzle-based wet blasting, slurry, and fluidized abrasive blasting attractive options for surface cleaning and preparation. Restoration of steel and concrete surfaces has relied heavily on sandblasting and other dry blasting techniques. For over a century, dry blasting has been an effective, but dusty approach in removing coatings, contaminants, corrosion and residues, with emissions of silica and other abrasive or substrate particles linked to negative health and environmental impacts. As an alternative to dry blasting, wet blasting was developed in the 1960s to minimize fugitive dust by mixing water with the abrasive spray. While effective in reducing dust, wet blasting was initially slow to catch on due to heavy water use and the problem of containing and disposing of contaminated water. Contractor familiarity with dry blasting and additional costs associated with the water and abrasives of wet blasting also limited acceptance of the newer technique. More recent developments have made wet blasting more attractive to contractors and owners facing tough restoration tasks. Health, safety and environmental issues have been driving factors in the refinement of wet blasting. Early efforts followed the banning of sandblasting by several European nations in the 1950s and 60s due to concerns over silicosis, an occupational hazard associated with inhalation of silica dust. While the US has not totally banned sandblasting, the US Occupational Safety and Health Administration (OSHA) established a Silica Rule in 2016, decreasing the permissible exposure limit to respirable crystalline silica by 50 percent for general industry and maritime, and 80 percent for the construction industry. Wet blasting has also been subject to environmental regulatory limitations. The Federal Water Pollution Control Act, first introduced in the 1940s and amended several times since then, placed strict limits on the discharge of pollutants into navigable waters. States and cities have also scrutinized the amount of fugitive water in storm water systems due to the amount of water used by some systems. Consequently, various forms of wet blasting have evolved. Three main types are now available: nozzle-based wet blasting, slurry blasting and fluidized abrasive blasting. Each technique has its advantages and disadvantages. Early versions of wet blasting techniques focused on adding water to the abrasive stream in or around the nozzle of the blasting equipment. Water-injection nozzles (WIN) inject jets of water to dampen the abrasive as it leaves the nozzle, as shown in Figure 1. Halo (water-ring) nozzles surround the abrasive blast with a curtain of water, dampening dust after impact, as shown in Figure 2. Figure 1. Water-injection nozzles (WINs) use jets of water to dampen abrasive as it leaves the nozzle. Figure 2. Halo nozzles surround the abrasive blast with a curtain of water, dampening dust after impact. With water introduced into the blast stream at the nozzle, the abrasive stream velocity is reduced before it impacts the substrate, decreasing production when compared to slurry or fluidized abrasive blasting. Nozzle-based wet blasting also requires contractors to use specific WIN or halo nozzles that are heavier and more cumbersome than typical nozzles. WIN and halo nozzles have separate controls and require a dedicated pressurized water source, typically strapped to the blast hose. Operators must turn the water on or off separately from the blast control when using this method. Because WIN and halo nozzles can often be used with traditional sandblasting equipment, they provide dust suppression with relatively minimal equipment investment. While they can each suppress dust, both WIN and halo nozzles use significant amounts of water. Blasting equipment is typically on or off, which can decrease production and over-use water and media. Consequently, contractors often face significant disposal costs after a job is complete. Slurry blasting, also known as modified sandblasting, combines water and abrasive in a pot under air pressure. The mixture is drawn into the airflow using the Venturi effect, as shown in Figure 3. Figure 3. Slurry blasting combines water and abrasive in a pot under air pressure. While slurry blasting is more effective at dust suppression than nozzle-based wet blasting, it provides only limited flow control. Abrasive control is achieved by metering the amount of water and abrasive exiting the pressure pot as it enters the blast stream. Because of this limited flow control, slurry blasting also consumes relatively high amounts of abrasive and water. Slurry blasting allows contractors to use the same blast hoses and nozzles as typical dry abrasive blasting. During the blasting process, abrasive does the removal work, while water provides the dust suppression. If high amounts of water are introduced in the blast stream, a less efficient mixture of air, water and abrasive can result, producing slower removal rates. The higher amount of abrasive used means contractors again face significant disposal costs. A growing number of facility owners are exploring fluidized abrasive blasting, where water and abrasive are combined in a pot under water pressure, then injected into the airflow, as shown in Figure 4. Figure 4. Fluidized abrasive blasting combines water and abrasive in a pot under water pressure, then injects the mix into the airflow. Fluidized abrasive blasting provides finer control over the flow of the water/abrasive mixture, allowing for blasting of a wider range of surfaces and reducing the amount of media and water expended. The finer control is achieved by metering pressurized water into the pressure pot instead of metering the water-abrasive mixture exiting the pot. (Learn more in the article Blast Pressure: How to Get It Right.) Units such as the Graco’s EcoQuip 2 Vapor Abrasive blasters, shown in Figure 5, suppress dust up to 92 percent when compared to dry blasting and use, on average, one-fourth to one-half quart of water per minute. Figure 5. 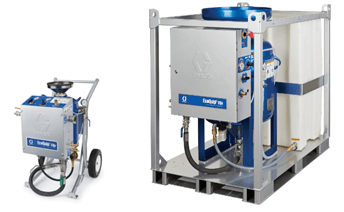 Graco’s Vapor Abrasive blasting units are available in both portable and fixed-skid configurations. Fluidized abrasive blasting addresses both the fugitive dust and the water discharge issues. This approach wets individual grains of abrasive material in water, resulting in increased mass as the abrasive is propelled through the blast hose. Wetted abrasive achieves higher impact force because the wetted abrasive is traveling at the same velocity as it impacts the substrate. For this reason, it requires less abrasive compared to dry blasting to complete the same projects. Because dust is minimized, less containment is generally required, and media clean-up time can be reduced. With less water use than slurry or other water-based technologies, Graco’s Vapor Abrasive blasting does not leave pools of water behind, and the likelihood of toxic runoff is greatly reduced. It also reduces rebound of abrasive particles, which pose risk to workers and the environment. The fluidized systems provide adjustable, precise control over the air pressure and water/abrasive mixture and reduce the amount of media and water expended. Fluidized abrasive blasting has proven effective in restoring a variety of surfaces. 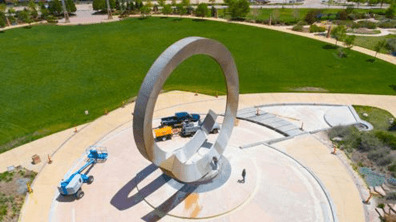 In Colorado Springs, Colorado, it was used to clean the exterior of the stainless steel Julio Penrose Fountain, located inside America the Beautiful State Park in Colorado Springs. City restrictions precluded sandblasting, so the Vapor Abrasive approach was used to successfully restore the sculpture to a new-looking appearance, as shown in Figure 6. Figure 6. The restored lower portion of a sculpture in Colorado Springs provided a distinct contrast with the yet-to-be-restored upper portion. Vapor abrasive blasting can address a variety of other removal and restoration situations, such as paint and coating removal on bridges and roadways, graffiti removal from walls, and storage tank cleaning. (To learn more about cleaning and restoring artwork and sculptures read Protecting Public Art Against Corrosion.) A wide range of pressures and abrasive media can be used, providing flexibility for various applications. In recent testing conducted by Graco, 4-foot-by-4-foot concrete slabs were treated with dry blasting, nozzle-based wet blasting and fluidized abrasive blasting to compare respirable levels of dust and silica. As shown in the video below, wet and fluidized abrasive blasting produced significantly lower levels of dust and silica than dry blasting. Fluidized abrasive blasting produced respirable dust at rates that would be below OSHA limits for both six- and eight-hour periods. Fluidized abrasive blasting also generated respirable silica at rates that would meet OSHA limits for respirable silica over a six-hour period. Each of the various types of wet blasting techniques offers advantages for certain situations. For small projects where dust suppression is not critical, nozzle-based wet blasting might suffice. Where more dust suppression is needed, slurry or fluidized abrasive blasting might be a better fit. The environmental and efficiency gains over dry blasting make these attractive options to owners facing tough cleanup tasks. Between slurry and fluidized blasting, the adjustable flow settings of fluidized blasting can improve efficiency and provide additional versatility in multiple situations. 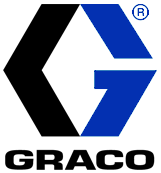 Wade Hannon is an Area Sales Manager – Specialty Products at Graco Inc. He is responsible for equipment demonstrations, technical support, distributor development and sales support, marketing and promotion within assigned territories, trade shows and internal sales support. Bryce Gapinski is Product Manager for EcoQuip surface preparation equipment at Graco. He has worked in both manufacturing and design engineering since 2012 and is currently pursuing a MBA from St. Thomas University.